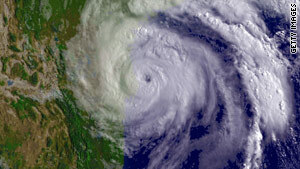 Forecasters say the 2010 Atlantic hurricane season could be above average this year. (CNN) -- Forecasters with the National Oceanic and Atmospheric Administration will release their seasonal outlook for this year's hurricane season Thursday morning. President Obama will also be briefed Thursday on the federal government's readiness. Forecasters say the 2010 Atlantic hurricane season, which starts on Tuesday, will be above average, with 15 named storms and eight of those becoming hurricanes. Colorado State University's forecasters William Gray and Phil Klotzbach released a report in April, saying that this year's hurricane system could be difficult. Forecasters said that El Nino conditions will dissipate by summer and that unusually warm tropical Atlantic surface temperatures will persist, leading to favorable conditions for hurricanes to develop and intensify. Of the eight expected hurricanes, the forecasters predict that four will strengthen to major ones, meaning Category 3 or higher on the Saffir-Simpson scale. Category 3 storms have sustained winds of at least 111 mph. The forecast said the probability of a major hurricane making landfall along the U.S. coastline is 69 percent. It said that there is a 58 percent chance of a major hurricane tracking into the Caribbean. However, the two forecasters emphasize that the prediction is preliminary and revised ones will be released on June 2 and August 4. A typical season has 11 named storms, six hurricanes and two major hurricanes, according to the National Oceanic and Atmospheric Administration. The hurricane season ends November 30, although later storms have been known to happen.